If you are looking for an unusual framework to co-create a unique Healing Center, or are part of a similar one already, please let me know if this work resonates with your own dream of Community Creation. 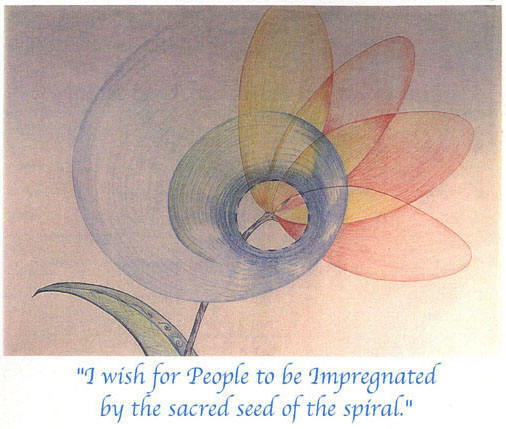 The text and the images are extracts from an 85-page Master thesis work, completed in 1997, at the University of Creation and Spirituality in Oakland, California. I am open to start such a sacred community or join in with an existing community who share similar values and that are creating sacred vessels for deep non-denominational spiritual work. I am inviting you to contact me in case you feel drawn to this particular vision, or want more information about the written proposal. based upon Art, Ritual, Sacred Geometry, Organic Architecture, sustainable living, and different healing modalities. "IT IS WITH JOY & EXCITEMENT THAT I TAKE ON THIS PROJECT"
I am delighted to prepare this proposal for a Village that fills my soul. I hope it will entice and excite others to join in my vision, and in its implementation. 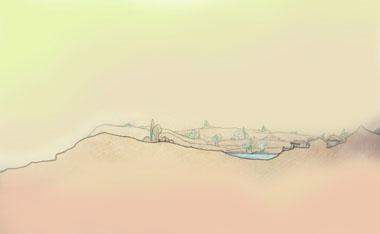 The core of this project is to build a Sacred Healing Village. This Kin of Kiva Village will be based in a natural setting, in combination with Ritual, Art, Music and Theater. The Village is largely self-contained. Its most sacred component will be the Kiva/Dome Center, located approximately half a mile above the village center. This Center will be the key spiritual source of the village, emanating its sacred presence out through the surrounding area. This sacred space is not a temple for any particular religion but a container for all kinds of traditions to grow. 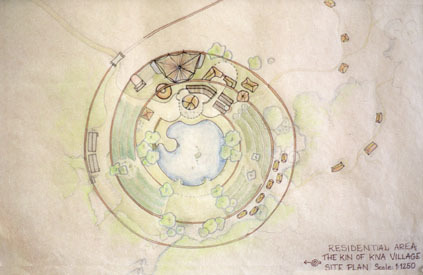 The Kiva/Dome Center is at the source of a site plan that unfolds into the surrounding open space and village areas, and which is manifested in the configuration of a double spiral. Great attention will be placed on sustainable living systems, permaculture and the environmental features of this ecologically-based intentional community. Our planet is going through major environmental crises - pollution, clear cutting, the extinction of many species, global warming, land and watershed destruction from pesticides, and spiritual alienation. My way of attempting to restore the imbalance in our environment is by envisioning and implementing a Healing Village that adopts modalities of eco-friendly resources. In addition, our earth also needs us to revere her spirit an essence. Bringing Ritual and Celebration to the land are important for restoring the planet's well-being. The Village will therefore serve as a combination of an earth-based sacred land container for ritual and a retreat structure for teaching and learning Arts, Theater and Sustainability. Topics - "The Blossoming of the Village"
The chapters below show the subjects dealt with in the proposal for the Healing Center. new life and opportunity - Be it!" The core team members who are building the village - The Kin of Kiva Village. The Minerals "Like the different molecules, busy to connect, to catalyze and to unite"
The Water "Like those sweet waves of persistent rippling - caressing us eternally"
The Sacred (Kiva) Core; The Middle (Transitioning) Core; The Community (Residential) Core - the essential layout of the Village. 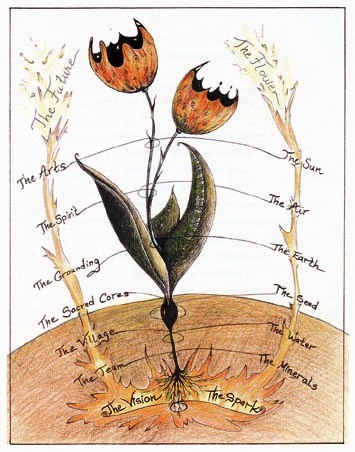 The Seed "Like that core essence filled with the hope of being fully loved inside its vibrational womb"
Sustainability, Natural Building Materials, Alternative Resources. 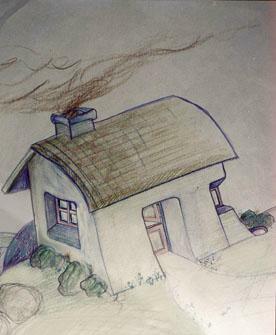 Environmental Projects and Intentional Community. and to rejuvenate us with her magic, deep and lush bed"
56 Ritualizing the Day, Collective Sleeping, Cathartic Ceremonies, Initiations and Dialogues. The Air "With you I shall always glide"
Self-Expression and the Sacred Life within and around us. The Sun "Like that irresistible gushing wave of red flame - enticing us to become alive - so fully!" The Future Outcome of the Village and Faith in its Manifestation. in delight and exquisite ecstacy"
This plan shows the envisioned residential area, witha body of water as it's focal point and a source of energy for gatherings in the community. The Community Building, Healing Center, Dining/Restaurant area, offices, green houses, permaculture beds, and individual guest units are all centered around the lake area. The member's residential units are located further away from the core activities. The spiraling brick path is organically beginning at the water source, expanding out in a Logarithmic fashion to eventually link up with the Fibonacci spiral formation which is the design around the Kiva/Dome sanctuary. This envisioned site section shows the general sense of the core residential area, where the Community Building, Healing Center, and the Dining /Restaurant area are adjacent to the lake with its surrounding permaculture beds. This envisioned land is preferably located adjacent to the sea shore and at the foot of the mountains; at the edge of two eco systems. 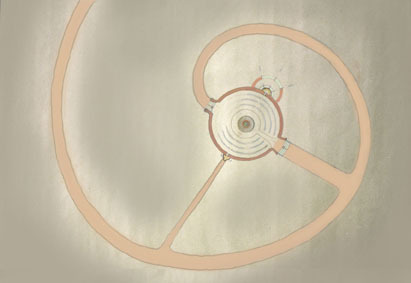 This plan shows how the Kiva/Dome sacred sanctuary is at the very core beginning of the spiraling path, based on the Fibonacci serial sequence and the expansion of this particular spiral form. This Kiva/Dome is the core element of the whole village, in where the community and visitors gather for events and sacred ritual. This design eventually links up with the residential Logarithm spiral through a meeting ground of a Vesica Piscis shaped body of water. 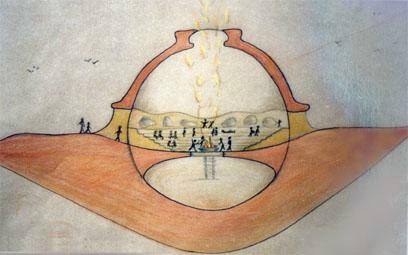 This plan shows how the Kiva/Dome sacred sanctuary is divided into two parts. The top part-the Dome with it's male principle, the sky and the protector of the Kiva. The bottom part-the Kiva with it's female principle and the ritual space deep in the earth. This sacred vessel is the main focal point where significant gatherings would be taking place, rituals, and different events that help build the spiritual community. This ancient form of double spiral, based on the yearly movement of the Sun has been depicted out through history and especially in cave paintings. I was magically drawn to its shape and based the Kin of Kiva on this configuration. The Fibonacci spiral, the Logarithmic spiral and the Vesica Piscis became the necessary components in conveying a deeper meaning to the formation of the Kin of Kiva Village. A whole stream of events issues from the decision, raising in one's favor all manner of material assistance which no man could have dreamt would have come his way. Whatever you can do or dream you can do, begin it. Boldness has genius, power and magic in it. Begin it now!